So after a very long decision period and research I decided to take up the 10 day money back guarantee for the Optimum 9200. Froothie UK were new to the UK market and they had some teething problems with their delivery. To cut the story short I received the first Optimum 9200 nearly 11 weeks after the original order and payment being made. I have to say the support team were very good to keep me from cancelling after such a period. My experience after another 2 machines being received is that their customer service is excellent. This includes needing a replacement part for a worn drive socket on the original machine and jug replacement on a subsequent machine. New Optimum 9200 with 2 Litre Jug. 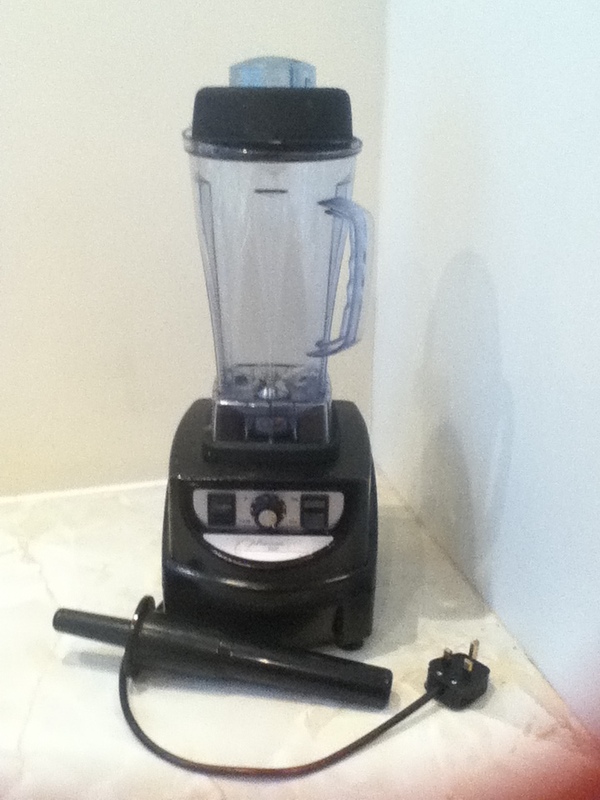 After I received my first new pet the Optimum 9200, I took it over to play with my friend’s pet the Vitamix! We did a direct comparison. However, since then I have received 2 more Optimums, a new Optimum 9200 and Optimum 9400. You can review the physical features of the Optimums on this website. 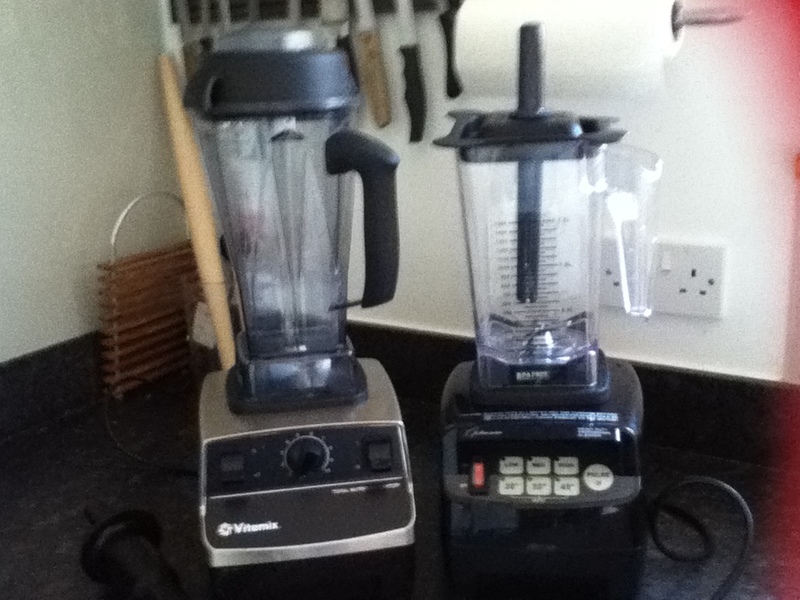 However, for a comparison of the performance against the Vitamix read on…. All 4 machines give a beautiful result; however the Vitamix and Optimum 9400 do so in approximately 6 minutes and the Optimum 9200’s took nearly 8 minutes. To review the recipe and full test with the Optimum 9400 click here. The Vitamix took the roasted almonds and made them into a smooth butter in less than 2 minutes. However, after nearly 10 minutes the Optimum 9200 with the original square 1.5 litre jug provided a powdery substance as shown below. The problem for the Optimim 9200 was down to the quantity in the 1.5 litre jug with a broader base. If we do the test with the new 9200 and Optimum 9400, both with 2.0L jugs, I believe there would not be an issue. I will update when test has been completed. 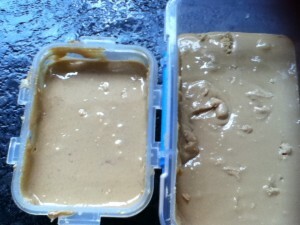 This time I put more peanuts into the Optimum 9200 with a 1.5L jug and covered the blades. Both machines worked equally well. 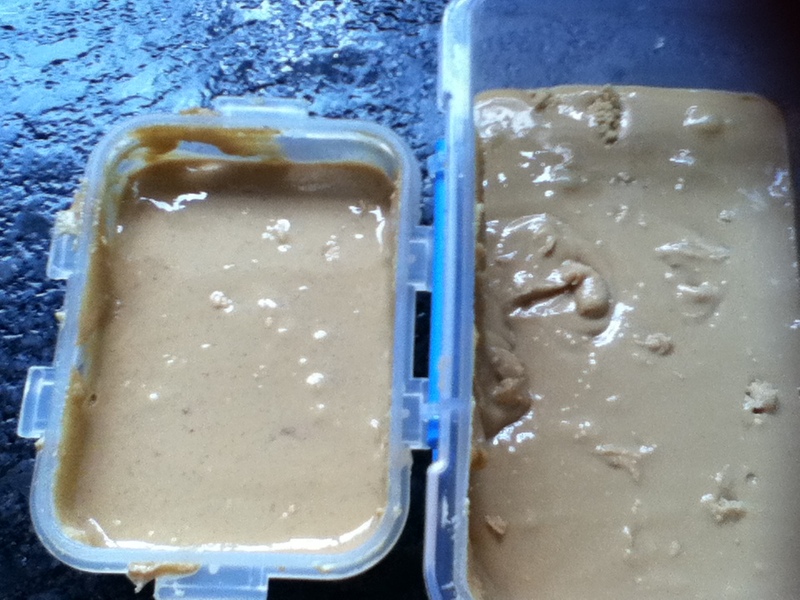 The Vitamix produced the peanut butter in about 1 minute. 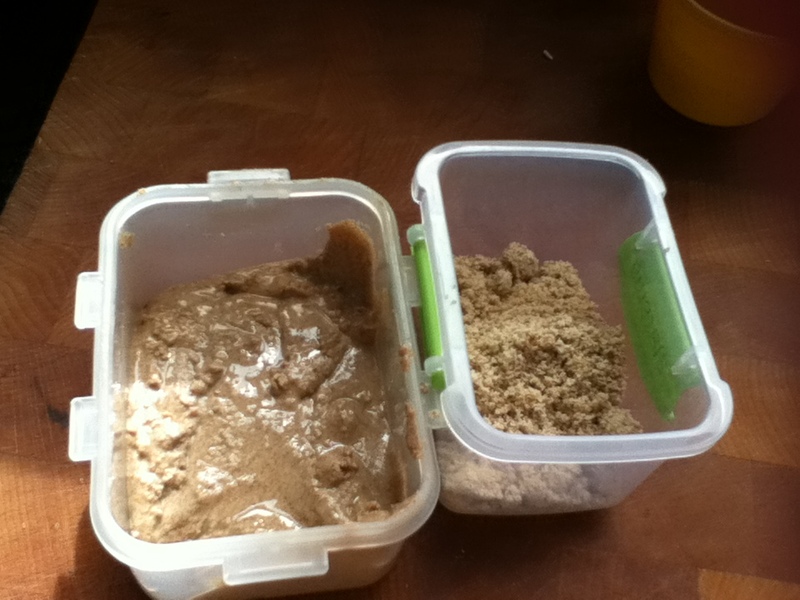 The Optimum took less than 3 minutes to get it to the same creamy texture as the Vitamix. 2 cans of chick peas into the Optimum and only 1 can into the Vitamix. 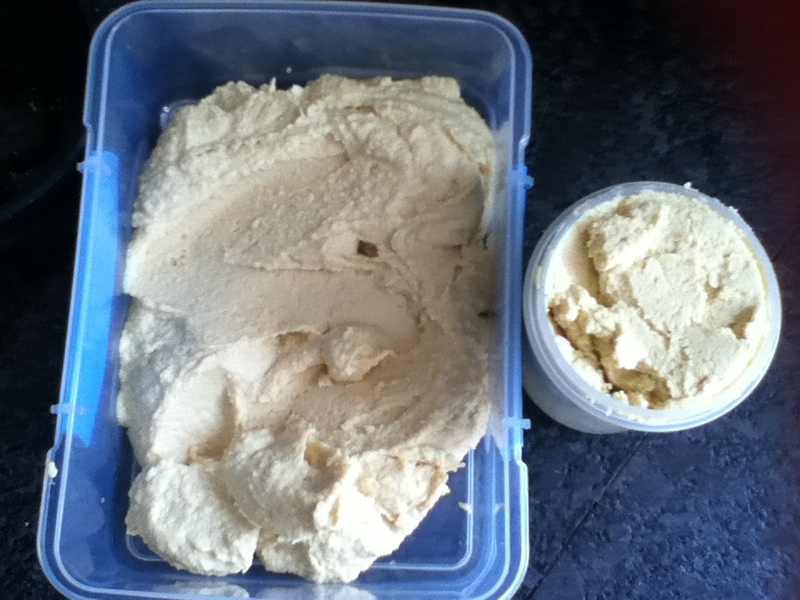 Both machines made smooth hummous in less than a minute. The Optimum’s hummous looks smoother, that is down to the fact that the chick peas were a different brand and had more water content. 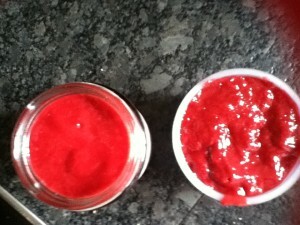 This raspberry melba sauce is delicious and so easy to make in either machine. It consists of frozen raspberries, redcurrant jelly, cornflour, lemon juice, sugar, and water. This time the Vitamix had an initial struggle and cut out while the Optimum’s performance was very good. This is probably because the raspberries in the Vitamix were frozen and the ones in the Optimum were pretty much thawed. For the melba sauce you blend until steam starts to form. 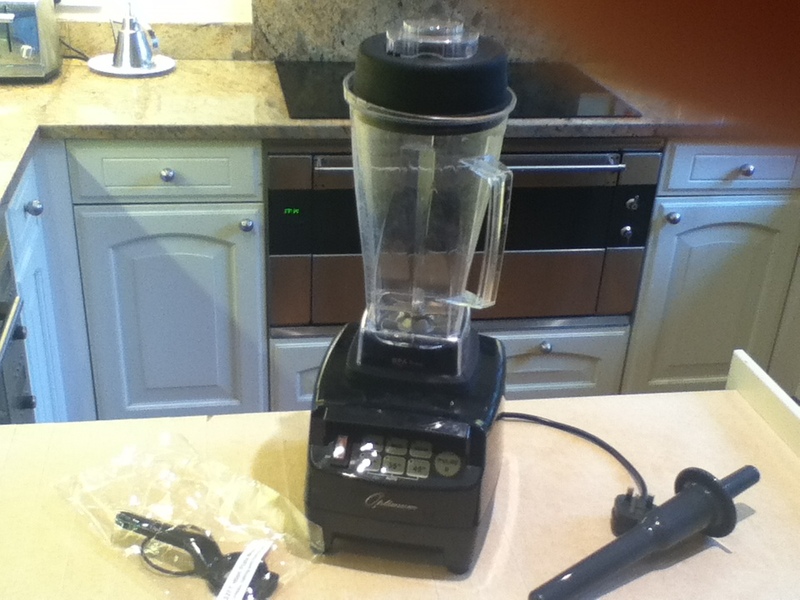 The overall results was about 10 minutes for the Vitamix and 12 minutes for the Optimum 9200. 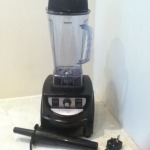 Good Value for Money against the Vitamix – Given what I wanted to achieve with the Optimum 9200 it appears to be good value for money. For the £200 saved I am happy to wait a few extra minutes for my results. With the Optimum 9400 the differences are hard to find. I really prefer the Optimum 9200 Automatic settings of 20, 35, and 45 second. With one touch you get a performance where the Optimum 9200 starts out slow and speeds up to the set time. The delivery and presentation is good. I received an Australian plug with a UK adaptor on the first machine, but this issue has now been addressed. Customer service deserve 4 stars! Well done Frances on starting your blog, I look forward to more posts and recipes I can steal especially Optimum /Vitamix showdowns. I am trying to find information on the optimum and how well it blends apples, blue berries etc.. as i have used the vitamix once before and despite the skins of the apples and blue berries it came out completely smooth with no bits, but i want to know if the optimum could produce the same smooth texture with fruits and veg with difficult to break up skins such as apples and blue berries. Any comments no this would be very helpful deciding in purchasing one of these. oh and I’m also from the uk and unsure of any good places to get one of these providing it can handle the above. The Optimum performed very well with a raspberry coolie. You could not detect any seeds. I would assume that it would do the same with the apples and blueberries. It will probably take longer then the Vitamix, but as noted on my site, the Optimum is £300 versus nearly £500 for a Vitamix. I purchased my Optimum online and it is sent from Australia. As noted on the site their service was not great, but it has improved and the Optimum does work. 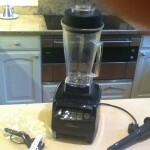 Since I purchased the Optimum I saw the Vitamix Aspire at Costco’s for £349. Despite the smaller jug of the Aspire, I may have opted for the Vitamix brand. Hope this reply helps with your decision. Good Luck! thank you for the reply, was thinking of the optimum 8800 (think its that one) as its going for 220 pounds at froothie.co.uk so still a lot cheaper than costco’s offer.